The durable and ergonomically designed AS-8150 CCD scanner is the best-value handheld scanners in its class. This mid-range CCD bar code scanner replaces traditional laser bar code scanners with a high-speed scanners, but at a lower cost. The AS-8150 has a high intensity aiming line and captures bar codes from as far away as 200 mm. High speed bar code captures at 200 scans per second use our patented "Digi-Decode" technology. This scanner is easy to aim and scans codes in any lighting environment. The AS-8150 features both handheld and fixed projection modes, as well as long-range activation and an adjustable stand (optional) for automated operation. Flash ROM with Meteor upgrade utility is included. Programmable characteristics Code type selection, check digit selection, Decoding options: Transmitted character delay, Header selection, trailer selection, message suffix, good read beep tone and volume. Scanner trigger selection. Keyboard emulation type (intermessage delay, keyboard type and keyboard language). Serial interface type (ACK/NAK, Xon/Xoff, RTS/CTS, good read LED control, start/stop bits). 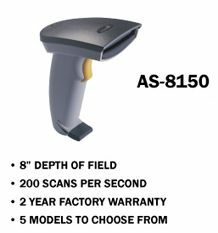 or call (541) 601-8282 for more information on the AS-8150 Bar Code Scanner.